If you’re leading a ski trip for your school this season, getting your students ready for the slopes will ensure they get the most from their time on the mountains. Skiing is a fantastic sport to inspire your students but it’s also a physically demanding one – especially if you have first-time skiers in your group. In the last few weeks leading up to your trip, your skiers will need to focus on three key areas to help them prepare for their action-packed week away; strength, endurance and flexibility. In addition to some dry slope sessions for the beginners, it’s a good idea to build a training scheme into your planning for the trip – maybe use the school sports hall to set-up a group exercise schedule or give your skiers an exercise plan to follow at home. Preparing them well for their exhilarating week away will help reduce the risk of injury and maximise the fun! All that knee-bending soon takes its toll on the leg muscles – especially the quads and glutes. These large muscle groups need to be built-up at least six weeks prior to your trip. Working on core stability also helps with posture and reduces the strain on the back, so it’s always best to start strength exercises early. Improving students’ general fitness will help them maintain their energy levels and reduces fatigue after a full day on the mountains. Sustained cardio activity such as running or cycling is a great way to raise the heart rate and improve general fitness. If your school has a gym, three sessions a week on the treadmill, bike or cross-trainer for up to an hour can work wonders in preparation for your trip. The importance of stretching shouldn’t be overlooked and should form an important part of the training schedule. Stretching properly after exercise is especially important for the legs. Stretching the quads, glutes, hamstrings, thighs and calves helps to flex and loosen the leg muscles, so it’s useful for your students to practise stretching regularly. 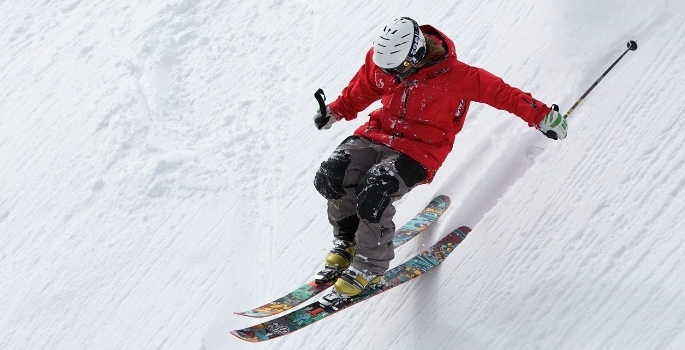 PGL-sponsored snowsport athletes Maisie Potter (snowboarder) and Jai Geyer (skier) give their top five exercise tips for improving strength, endurance and flexibility – why not try these with your students? 1. Body weight squats – great for building up the quads! Try to do four sets of 24 in a fast but controlled manner. 2. Box steps – stepping off a box and landing in a quarter squat flexes the ankles, knees and hips, encouraging good posture to prevent knee, ankle and other injuries. 3. Run up steps – keep your knees high to get the legs and lungs working. Running in general is a great way to build fitness and help recovery after a full day on the slopes. 4. Interval training – short bursts of movement help students prepare for the demands of the mountain altitude – try a mix of burpees, star jumps and lunges. 5. Other sports – participating in a range of other sports such as football, netball or hockey, improves movement-literacy and general fitness levels. The preparation doesn’t stop once you’re on the mountain either. A group warm-up before hitting the slopes will increase everyone’s body temperature early in the day to help reduce the chance of injury. Side lunges and squat jumps are great for activating muscle groups and they can be fun to get everyone fired up for the thrilling day ahead!